Telecoms.com periodically invites third parties to share their views on the industry’s most pressing issues. In this piece Adam Leach, Director of Emerging Technology at Nominet takes a look at some of the things the UK things to do in order to compete globally in the 5G era. It may be just one digit up in the numbered ‘generations’ of mobile communications, but 5G presents a heady leap beyond its predecessors when it comes to capabilities and capacities. This next generation connectivity promises to enable a multitude of new use cases beyond our smartphones, with the potential to transform industries from agriculture through to manufacturing. It is the Government’s ambition for the country to be a world leader in 5G, supporting exploration of the new technology through the Industrial Strategy Challenge Fund. However, this can only be achieved if the existing approach to spectrum policy is changed. According to Ofcom’s latest figures, 43% of the UK is still without 4G; the problem could be significantly worse for 5G unless we act now and amend our approach to telecommunications. The issues arise from the unintended consequences of a spectrum policy that doesn’t adequately incentivise network operators to deploy infrastructure widely across the whole country. This causes a digital divide which threatens to undermine our country’s long term economic aims by exacerbating various existing social challenges, leaving too many people and businesses behind as we try to digitally advance as a nation. Now is the moment to make the changes that would see connectivity and coverage meet existing needs and cope with the demands of the future. We are not the only nation aware of these challenges, nor the only one considering making fundamental changes to the way we use spectrum. In the US, the Citizens Broadband Radio Service (CBRS) is underpinned by spectrum sharing, while in Japan, the Ministry of Internal Affairs and Communication is planning to focus on dynamic spectrum sharing, creating a system that allows frequencies to be assigned to providers on demand in a bid to prepare the country for 5G. Considering Japan is consistently ranked as a leading tech nation, with the US not far behind, these international efforts to better manage the use of spectrum to prepare for the rise of IoT and 5G only endorses the use of a similar one here in the UK. A recent review by the Department for Digital, Culture, Media and Sport (DCMS), the Future Telecoms Infrastructure Review (FTIR), has laid out an alternative model for telecoms in the UK; the market expansion model. I believe this presents the best option for deploying 5G, and it relies on ushering in an improved approach to the selling, sharing and using of spectrum. Fundamentally, a move towards dynamic spectrum management for pioneer 5G bands will help us realise seamless connectivity across the UK. The approach will facilitate a greater number of smaller players to enter a market currently dominated by the largest telecommunications companies and provide access to unused areas of the spectrum. Under the existing auction model, the largest companies purchase the rights for nationwide exclusive access to spectrum, often resulting in spectrum being left fallow and citizens without coverage. We can’t be so flippant with this finite resource when it comes to 5G. Dynamic sharing offers a means of maximising available spectrum to support our rapidly growing demands and should help ensure the UK doesn’t fall behind other tech nations when 5G becomes the norm. We also must be realistic about the sustainability of the existing investment model. Up to now, Mobile Network Operators (MNOs) have shouldered the weight of network development, but the decline in revenues and low growth of recent years underscore how unsuited this approach is for the long term. It is clear that 5G has moved beyond the mobile network coverage focus of previous generations; we now need a wider market with new players to bring innovation and new technologies to the space. We also require new business models and the higher levels of investment required to achieve the UK’s 5G ambitions. This is only possible if we offer an incentive to invest in and innovate the ecosystem, which the new model would support. It mustn’t be forgotten that time is of the essence, as the Government seeks to give the majority of the country 5G coverage by 2027. The current spectrum policy means 5G coverage will only be rolled out when (and if) the MNO can make the financial case for deployment, but the new model would allow new players to concurrently deploy their services into the market, making use of the available spectrum without relying on buying a nationwide license. This increased speed of deployment will be a real advantage when businesses and livelihoods rely on 5G coverage. This in turn makes good economic sense too. The Future Communications Challenge Group of January 2017 estimated that the economic impact of 5G in the UK could be around £112bn in 2020, rising to £164bn in 2030. If the UK was to lead technology development in 5G, the impact would rise to £198bn in 2030; about 5.7% of the UK’s GDP. Considering the various uncertainties around Brexit and leaving the EU, a reliable revenue stream is to be welcomed. When it comes to connectivity, the game has changed. 5G is the future, and we need a future-ready model that can meet the demands we will place upon it, now and in the years ahead. The new model from DCMS offers us a compelling, fit-for-purpose approach that could overcome the existing issues and pave the way for the seamless connectivity the UK needs to be a world leader in 5G. 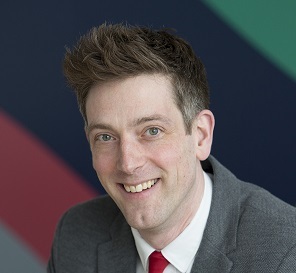 Adam Leach is Director of Emerging Technology at Nominet, leading innovation and new product development, and serves as Non-Executive Director at the Microbit Educational Foundation. Previously Adam was at Ovum, a global analyst firm, leading research on smart devices to provide market insight and intelligence on consumer technology. Adam’s background is in software engineering and he was the technical lead for the world’s first smartphone, the Nokia Communicator.